If you are in the market for a battery operated 3D Printer, the new Pbag might be worth more investigation, and it has just launched its Indiegogo crowdfunding campaign to raise €50,000 to help take the concept into production. Being a battery operated 3D Printer enables the PBag to be very portable, but still enables it to provide printing speeds of up to 500mm/s in rapid mode using 1.75mm PLA and ABS filament for up to 12 hours at a time. “We wanted to re- imagine the way you work outside your office , you can print with Pbag 3d models from high details at any party you are, in the office , on the shop floor , everywhere , imagine having to make a change in the face of in the workshop or meeting with your client , well !! will not go back in the office , and print out the return , you can now make actual what has changed or designed with your team in real time. 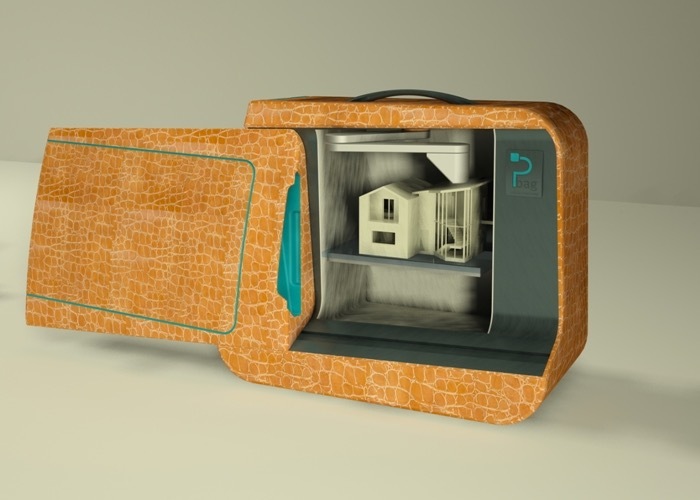 The Bag project is looking to make the jump from concept to production, so if you think the PBag battery operated 3D Printer is something your projects could benefit from, visit the Indiegogo website now to make a pledge and help PBag become a reality via the link below.